Follow only what is right, loving, and good. You cannot go wrong when you allow the Spirit of Christ to guide you. Use these 3 simple keys. Follow me! Imagine Jesus walking up to you and saying those words. Have you heard Him say to you, follow me? This Bible lesson points out the simple keys to true Discipleship. You must die to (deny) self and be willing to endure all that comes (take up your cross). Once you decide to do so, then you can be a true follower of Jesus. Is this asking too much? To turn down the appetites or desires of your flesh. Jesus set the example “Not my will, but yours…” (Luke 22:42). Accept that you no longer belong to you. Jesus paid the price to set you free from the penalty for sin. For the Son of Man also did not come to be waited upon, but to wait on others, and to give His life as the redemption-price for a multitude of people [Mark 10:45 (WNT)]. Be ready to die, i.e., both in a spiritual way, to sin and physical death (martyr). So let it be with you — regard yourselves as dead to sin, but as living for God, through union with Christ Jesus [Romans 6:11 (OEB)]. To take up your cross is to be willing to submit to and obey God. Ready to suffer and go through tests (difficult times). Jesus carried His cross, the disciples took up theirs, have you? Be you followers of me, even as I also am of Christ [1 Corinthians 11:1 (AKJV)]. If you want to be a true follower of Jesus, do as He asks. Be prepared to make sacrifices as you obey God. You will get your reward if you follow His example (Matthew 16:27). [And] whoever does not carry his own cross [i.e., his responsibilities with all their difficulties] and follow me cannot be my disciple. [Luke 14:27 (AUV)]. Do you understand the 3 simple keys for true disciples of Jesus? 1. Deny self (allow God’s will for your life) 2. Carry your cross (be committed to God) 3. Imitate Jesus (do as He did)! For whoever would [try to] save his life [i.e., by neglecting spiritual things] will lose it [i.e., miss out on the blessings of God]. But whoever [is willing] to lose his life [i.e., in commitment to God’s service] for my sake and [the work of] the Gospel’s sake, will save it [i.e., from the consequences of sin and separation from God]. 36 For what would it benefit a person to gain the whole world [i.e., of material things and pleasures] and give up his life [i.e., of spiritual blessings] [Mark 8:35-36 (AUV)]? Accept Jesus as the expert for living this life. Take on His ways. Submit to the guidance of the Spirit of Christ (The Holy Spirit). Most of all obey His advice (the Word)! Follow Christ and be blessed—♥ Tim ☺. 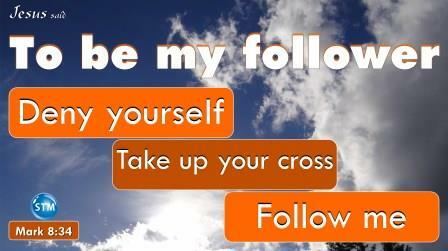 ♥ Question for “Follow” the Bible lesson: Have you decided to follow Jesus? Imagine Jesus walking up to you and saying “Follow Me”. Will you do it? #follow Click/Tap pic 4 more.